Design flood estimations display relatively wide confidence bands of uncertainty around all estimates of flood magnitude-frequency relationships. Taking cognisance of this, and the fact that most of the available design flood estimation methods in South Africa were developed in the 1970s and have not been updated since, led to the development of the Standard Design Flood (SDF) method (Alexander 2002a; 2002b; 2003). 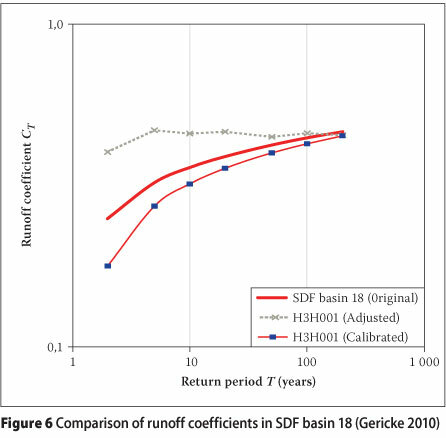 In this study, the SDF method was evaluated by establishing the accuracy of the regionalised SDF runoff coefficients, taking both the areal extent and homogeneous hydrological catchment responses into consideration. The SDF runoff coefficients were evaluated, calibrated and verified at a quaternary catchment level in SDF basin 9 (primary study area) and in 19 of the other 29 SDF basins in South Africa (secondary study areas) by establishing catchment parameters and evaluating the ratios between the results obtained through the SDF method and probabilistic analysis. The results showed that the original SDF method overestimated the magnitude and frequency (return period) of flood peaks in all the basins under consideration, while the verification results confirmed that the calibrated/verified SDF method, based on quaternary runoff coefficients, significantly improves the accuracy in comparison with the probabilistic analysis results. The result confirmed that the probabilistic-based approach of the original SDF method does not have the ability to overcome the deficiencies evident in the other design flood estimation techniques used in South Africa. Revision of the runoff coefficients at a quaternary catchment level is proposed. The last decade in southern Africa was characterised by several damaging flood events, especially the February 2000 floods in the northeastern part of South Africa, Zimbabwe and Mozambique (Alexander 2002a). On considering the economic and environmental impact of these and other flood events, the importance of flood frequency analysis becomes evident (Smithers 2011). However, reliable estimates of flood frequency in terms of peak flows and volumes remain a constant challenge in hydrology (Cameron et al 1999). Cordery & Pilgrim (2000) also highlighted that the international demands for improved design flood estimations have not been met with any increased understanding of the fundamental hydrological processes. According to Van der Spuy & Rademeyer (2010), this is also the case in South Africa where the search continues for a universally applicable method for design flood estimation. In essence, the failures of civil engineering structures (e.g. bridges, culverts, dam spillways and drainage canals) caused by floods are largely due to the immense variability in the flood response of catchments to storm rainfall, which is innately variable in its own right. Consequently, flood estimations for design purposes can be expected to display relatively wide confidence bands of uncertainty around all estimates of flood magnitude-frequency relationships (Alexander 2002a; 2002b; 2003). Thus, both the occurrence and the frequency of flood events, along with the uncertainty involved in the estimation thereof, as well as the lack of updated design flood estimation methods in South Africa since the 1970s, indicate that there is an urgent need to revise existing methods or develop alternative design flood estimation methods by using about 40 years of additional observed data. The developmental effort in this regard by Alexander (2002a) led to the development of a numerically calibrated version of the Rational Method (RM), known as the Standard Design Flood (SDF) method, which incorporates engineering factors of safety to accommodate the uncertainties in hydrological analyses at a regional level (Alexander 2002a; 2002b; 2003). In this study, the SDF method was evaluated in specific areas by establishing the accuracy of the regionalised SDF runoff coefficients, taking both the areal extent and homogeneous hydrological catchment responses into consideration. The question of whether or not the probabilistic-based approach of the SDF method has the ability to overcome some of the deficiencies evident in the other techniques used for design flood estimation, was investigated and alternative revisions at a quaternary catchment scale were proposed. The development of the original SDF method is reviewed in the next section. The purpose of the study is discussed and explained in the section thereafter, followed by an overview of the spatial distribution and characteristics of the study areas. The methodologies involved in assessing the paper's purpose and objectives are then expanded on in detail, followed by the results and discussion, conclusions and recommendations. In the Introduction the wide confidence bands of uncertainty around all estimates of flood magnitude-frequency relationships were emphasised. However, Alexander (2002a; 2002b; 2003) indicated that these uncertainties cannot be satisfactorily accommodated, and necessitate a new, single approach to the estimation of the design flood, namely the SDF method. Alexander (2002a; 2002b; 2003) reviewed all the different design flood estimation methods (deterministic, empirical and probabilistic) in use in South Africa and selected the conventional RM as the basis for the SDF method to be used in the delineated basins. At least one hydrological flow-gauging station and one representative daily rainfall station were selected for each of the 29 basins in the development of the SDF method. Probabilistic analyses of the annual maximum series (AMS) were conducted at 152 flow-gauging stations to calibrate and verify the SDF method in the various basins (Alexander 2002a; 2002b; 2003). The design rainfall information was based on the data of 1 946 daily rainfall stations contained in Technical Report (TR) 102 (Adamson 1981). The SDF basins are shown in Figure 1. The developed SDF method was intended to replace the previously recommended RM and Synthetic Unit Hydrograph (SUH) method. Although the basic philosophy of the SDF method is based on planning (cost-optimising procedures with engineering factors of safety) and design (estimation of conservative floods) objectives (Alexander 2002b; 2003), the question remains whether these two objectives will obviate the need for design engineers to undertake sophisticated hydrological analyses to accommodate the inherent uncertainties present in the current design flood estimation procedures. It is anticipated that the results from this study will assist in addressing the design engineers' problems regarding decision-making in design flood estimation. The purpose of this study was to evaluate, calibrate and verify the SDF runoff coefficients at a quaternary catchment level in SDF basin 9 (primary study area) and in 19 of the other 29 SDF basins in South Africa (secondary study areas) by establishing the catchment parameters and the ratios between results obtained with the SDF method and those obtained through the probabilistic analysis of the observed flow data (SDF/ probability distribution ratios). 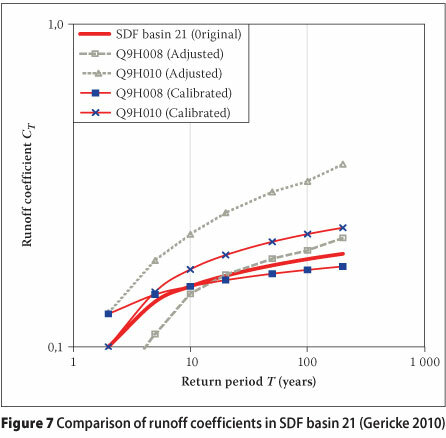 These newly calibrated quaternary runoff coefficients were then compared with the existing regional SDF runoff coefficients. The work done by Van Bladeren (2005) during the compilation of the South African National Roads Agency Limited (SANRAL) Drainage Manual resulted in a proposal that adjustment factors be used to balance the tendency of the SDF method to provide over-conservative results. The runoff coefficient adjustment factors as proposed by Van Bladeren (2005) were therefore also evaluated as part of this study. The secondary study areas were purposely evaluated to enhance the understanding of the results obtained from the primary study area, as well as to illustrate the relevance thereof in a South African context. This served as clarification of the influence of different climatic regions (Highveld as opposed to Mediterranean/ southern coastal regions), types of weather systems (summer convective as opposed to winter/all year orographic/frontal rainfall) and rainfall occurrence frequencies on the depth, area, duration and movement of storm rainfall, which in turn influence the magnitude and frequency of floods as estimated by the SDF method. Firstly, it was hypothesised that the calibration of the SDF method at a quaternary catchment level will improve the accuracy and practical use thereof. Secondly, it was hypothesised that the extent of the current delineated SDF basins is too large, with associated non-homogeneous flood-producing characteristics. Thirdly, it was hypothesised that the runoff coefficients are essentially functions of the return period and time of concentration. The fourth hypothesis was that the Log-Normal (LN), Log-Pearson Type III (LP3) and the General Extreme Value (GEV) probability distributions, or a combination thereof, are the most suitable for flood frequency analyses at a single site in South Africa. The primary study area covers 34 795 km2 between 28°25' and 30°17' South and 23°49' and 27°00' East and comprises the C5 secondary drainage region (SDF basin 9), which consists of the tertiary Riet River and Modder River catchments. The primary study area is characterised by 99,1% rural areas, 0,7% urbanisation and 0,2% water bodies (CSIR 2001). The natural vegetation is dominated by Grassland of the Interior Plateau, False Karoo and Karoo (light bush). Cultivated land is the largest human-induced vegetation alteration in the rural areas, while residential and suburban areas dominate the urban areas. The topography is gentle (slopes between 2,4% and 5,5%) and water tends to pond easily, thus influencing the attenuation and translation of floods. The Mean Annual Precipitation (MAP) is 424 mm, ranging from 275 mm in the west to 685 mm in the east. It is characterised as highly variable and unpredictable. The rainy season starts early September and ends mid-April with a dry winter (Midgley et al 1994). The Modder and Riet Rivers are the main river reaches and discharge into the Orange-Vaal River drainage system (Seaman et al 2001). Like most inland rivers in South Africa, these rivers were traditionally seasonal rivers, but due to the construction of significant storage dams, they now resemble permanent rivers. The secondary study area catchments ranged in size from 126 km2 to 33 277 km2 and are located within basins 1, 2, 4 - 11, 16 - 18, 21 - 23, 26, 28 and 29. The locations of the primary and secondary study areas are shown in Figure 1. This section provides the detailed methodology followed during this study, which focuses on the evaluation and calibration of SDF runoff coefficients and flood peaks, the verification of calibrated runoff coefficients and flood peaks, and the statistical assessment of results. 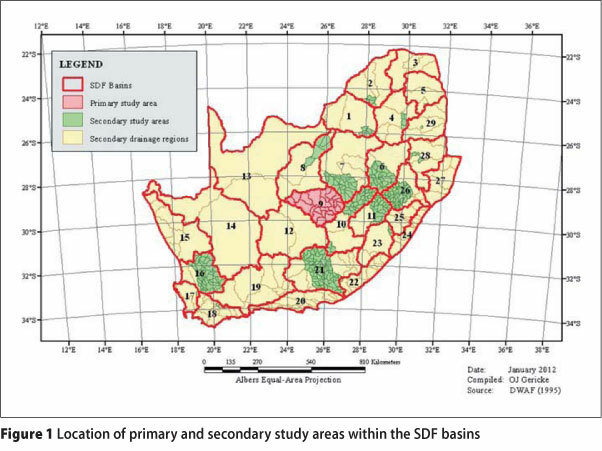 To evaluate and verify the original (Alexander 2003), adjusted (Van Bladeren 2005) and calibrated (this study) SDF methods at a quaternary catchment level in SDF basin 9 (primary study area) and the other randomly selected SDF basins in South Africa (secondary study areas), the following procedures were followed: establishment of physical catchment parameters, probabilistic analyses, selection of representative rainfall stations, and numerical calibration of runoff coefficients. All the required catchment input parameters of SDF basin 9 (average main watercourse length and slope, time of concentration, design rainfall intensities, average number of days per year during which thunder was heard (R) and areal reduction factors (ARFs)) were determined in a similar fashion as for the original SDF method (Alexander 2002a; 2002b; 2003). In all the other SDF basins under consideration, the catchment areas and time of concentration were based on previous research conducted by Petras & Du Plessis (1987) and Parak & Pegram (2006). Probabilistic analysis of the AMS was conducted at a representative flow-gauging station in each catchment under consideration to summarise the observed flood peak data, estimate parameters and select appropriate theoretical probability distributions. The observed flood peak data was summarised by ranking the AMS in a descending order of magnitude. The Cunnane plotting position, based on a general plotting formula, was used to assign a probability to the flood peaks. The parameter estimation was largely based on the Method of Moments (MM), although the usefulness of Linear-Moments (LM) estimation to fit the General Logistic (GLO) probability distribution was also investigated. Several of the AMS data sets were characterised by insufficient record lengths (e.g. missing data, low outliers and flood peaks exceeding the hydraulic capacity of flow-gauging structures), which made it impossible to conclusively select a single probability distribution that could consistently provide flood frequency estimates for return periods much greater than the period of record. To overcome this limitation of single site analyses, a Mean Logarithm Value Approach (MLVA), based on the mean values of the logarithms of two or more probability distributions, were used as the most suitable combined probability distribution at a single site or flow-gauging station. The MLVA, as expressed in Equation 1, is also used as a standard method in the DWA (Directorate: Flood Studies) (Van der Spuy & Rademeyer 2010). N = number of probability distributions used. The individual peak flows (Qi) can either be based on the combination of two or more theoretical probability distributions, e.g. Extreme/Log-Extreme Value Type I (EV1/ LEV1), LN, LP3, GEV and/or GLO distributions. Statistical properties, visual inspection of the plotted values and Goodness-of-Fit (GOF) statistics were used to select the most suitable single probability or combined probability distribution in Equation 1. Both the EV1 and LEV1 probability distributions have a fixed skewness of 1,14; hence the limited use thereof in flood hydrology. The LN distribution was only used where the logarithms of the observed data have near symmetrical distribution or where the skewness coefficients were close to zero. In all other asymmetrical data sets, the LP3 distribution was used instead. The GEV distributions were used at asymmetrical data sets characterised by either positive (Extreme Value Type II) or negative (Extreme Value Type III) skewness coefficients. A total of 44 catchments were evaluated of which 12 fall within the primary study area. The probabilistic analysis results of eight of the catchments were based on the GEV distribution, as obtained from previous research conducted by Parak & Pegram (2006). These results were therefore not analysed again. However, the nature and record length of the observed flood peak data sets initially used by these authors are unknown. ■ Average meteorological conditions: The MAP and design rainfall depths associated with return periods ranging from 2 to 200 years of the selected station must have a high degree of association with the MAP and design rainfall depths as obtained by the Thiessen polygon method using the total number of rainfall stations within the catchment(s) under consideration. ■ Record length: Where possible, a minimum record length of 50 years must be used in order to enable the selection of a distribution that could consistently provide adequate rainfall frequency estimates for return periods much greater than the period of record. However, shorter records (between 40 and 47 years) were used in 11% of the secondary study areas to evaluate the SDF method due to the limited number of suitable rainfall stations available in five of these catchments. The numerical calibration of the runoff coefficients used in the SDF method followed the probabilistic analyses and the selection of a single rainfall station in all the catchments under consideration in both the primary and secondary study areas. The purpose of the calibration was to fit the results obtained by the probabilistic analysis with those of the SDF method in order to establish the SDF/probability distribution ratios and adapted quaternary SDF runoff coefficients for return periods, ranging from 2 to 200 years. This was accomplished by determining the C2 (2-year return period) and C100 (100-year return period) runoff coefficients in Equation 2 (Alexander 2003) in such a way that the calibrated runoff coefficients (CT) for a range of return periods resulted in the best fit between the design values of flood peaks based on the probabilistic analysis and the SDF method (Equation 3; Alexander 2003). YT = return period factor. These coefficients (C2 and C100) were changed manually until an appropriate fit with the probabilistic analysis results was achieved, after which values of CT were coaxially plotted with the regional SDF runoff coefficients from Alexander (2003) against the return period. This exercise was repeated with the runoff coefficient adjustment factors as proposed by Van Bladeren (2005) to validate these runoff coefficient adjustment factors. Verification tests were conducted in 16 catchments that were not used in the calibration exercise to establish whether the calibrated runoff coefficients were predictable and to confirm that the method was reliable. In order to verify the CT values achieved during calibration, it was necessary to find some physical or regional descriptors with which to relate the runoff coefficients and to enable the use and extension of the calibrated runoff coefficients to ungauged catchments. Several regional descriptors, such as MAP, average catchment slope and land-use distribution, were taken into consideration in combination with the CT values to establish whether or not any relationship existed on which to regress the runoff coefficients. The 16 catchments used in the verification exercise, and for which AMS were available, were selected based on the fact that their physical or regional descriptors were similar to the catchments used during the calibration exercise, in order to result in near homogeneous hydrological responses. These catchments ranged in size from 26 km2 to 23 067 km2, with eight catchments within SDF basin 9 (primary study area) and eight catchments within SDF basins 6, 7, 10, 18 and 21 (secondary study areas). Regression (coefficient of determination) and descriptive (Chi-square) statistics were used to evaluate the GOF of the probabilistic analyses (fitted probability distributions). The coefficient of determination (r2) calculations were based on the full record length where the ranked observed values, with their associated probability or return period, were compared with the theoretical probability distributions. The Chi-square statistics were evaluated by making use of the concept of contingency tables, consisting of margin totals, which were used to establish the expected estimated values. The comparisons between the probabilistic analyses and the calibrated and verified versions of the SDF method were evaluated in the same manner. The results based on the methodology used in this study are discussed next. The evaluation and calibration of SDF runoff coefficients and flood peaks are discussed first, followed by a discussion on the verification of calibrated runoff coefficients and flood peaks. In conclusion, the statistical assessment of results are highlighted. The MLVA not only overcame the limitation of AMS data sets at a single site characterised by insufficient record lengths, but also took cognisance of the strong evidence that in South Africa most of the high flood peaks are a result of rare and severe meteorological phenomena. Alexander (2012) also confirmed that the AMS of these floods could consist of a mixture of two or more statistical populations with different parameter values and associated flood peak frequency relationships, particularly if preceding severe rainfall storms occur in close succession. Alexander (2012) also emphasised that: "It is a serious mistake to assume that a single probability distribution method can be applied to all the data at the site." The MLVA inclusive of the LP3-GEV/ MM distributions dominated the probabilistic analyses in 42% of the catchments, followed by the MLVA inclusive of the LP3-GEV-LN/ MM distributions in 28% of the catchments. The LP3/MM distribution was the only distribution which was used as a single most suitable distribution in 11% of the catchments. The remaining 19% of the catchments under consideration were characterised by a different combination of the above-mentioned distributions. However, when Equation 1 was used to combine two or more probability distributions, it was impossible to indicate which probability distribution would be the best suited for a specific return period range in all the catchments. The SDF basin 9 (primary study area) results for return periods ranging from 2 to 200 years based on the most relevant distributions are listed in Table 1. The different results obtained using the arithmetic mean and Thiessen polygon methods respectively to calculate the average catchment design rainfall are listed in Table 2. 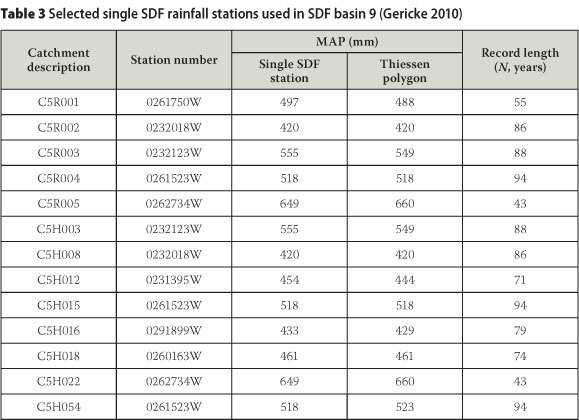 Table 3 provides the selected single rainfall stations in each catchment under consideration in SDF basin 9 in comparison with the catchment design rainfall calculated using the Thiessen polygon method. The number of rainfall stations used for averaging the design rainfall varied from catchment to catchment with an overall average of one station per 100 km2. It was observed that the arithmetic mean values slightly exceeded the Thiessen polygon values in each catchment, but the coefficient of determination (r2) of 0,98 confirmed the high degree of association, and highlighted the even areal distribution of the rainfall stations and the relatively flat topography. SDFVerified Verified SDF method at a quaternary catchment level used to evaluate the calibrated version of the SDF method. 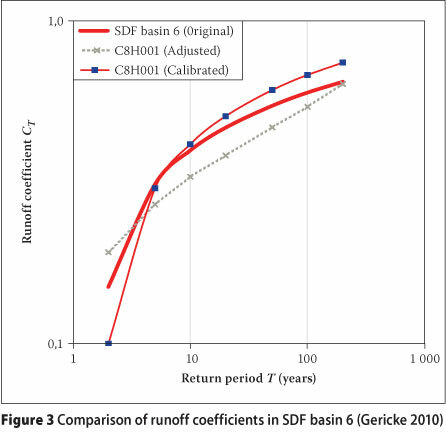 The original and calibrated C2 and C2oo runoff coefficients of SDF basin 9 presented in Table 4 are characterised by large proportional differences between the values. The differences between the original and adjusted runoff coefficients were found to be 45% (60 - 15) in all cases, since the adjustment factors as proposed by Van Bladeren (2005) are only used to adjust the final CT coefficients. In the case of the calibrated runoff coefficients, the proportional differences tended to decrease with an increase in the MAP, with a 45% difference for MAP less than 500 mm, a 38% to 41% difference for MAP ranging from 500 to 600 mm, and a 22% difference for MAP exceeding 600 mm. It is important to note that the original MAP (376 mm) in SDF basin 9 is also less than 500 mm, confirming the trend identified. It indicated that the antecedent soil moisture status in the quaternary catchment(s) under consideration introduces additional variability into the rainfall-runoff process and that the hydrological response in each quaternary catchment will be different. This can be ascribed to the difference in soil permeability which controls the infiltration rate and consequently the balance of rainfall that constitutes surface runoff and contributes to the flood peak. Table 5 provides a summary of the results obtained during the numerical calibration of the SDF runoff coefficients in SDF basin 9. The original, adjusted and calibrated runoff coefficients (CT), as calculated using Equation 2, are shown in Table 5. 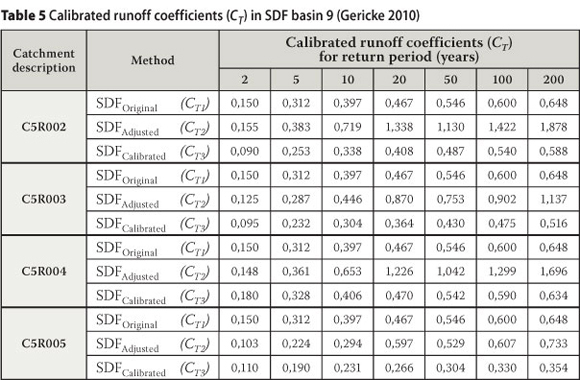 The original runoff coefficients of SDF basin 9 ranged from 0,150 (2-year return period) to 0,648 (200-year return period), while the calibrated runoff coefficients ranged from 0,090 (2-year return period) to 0,634 (200-year return period). The adjusted runoff coefficients based on the adjustment factors proposed by Van Bladeren (2005) ranged from 0,103 (2-year return period) to 1,878 (200-year return period). According to Van Bladeren (2005), the latter runoff coefficient exceeding unity is justified, since it is used when the SDF method overestimates the more frequent events and underestimates the extreme events in a particular basin. However, the question arises whether or not the adjustment factor can successfully describe a meaningful relationship between the regional descriptors (average catchment slope, catchment area, land-use distribution and MAP) and the CT coefficients as shown in Equation 4 (Van Bladeren 2005). y = regional descriptor (exponent). Based on the results listed in Table 5, it was interesting to note that the runoff coefficients adjusted by Equation 4 had a tendency to decrease in magnitude with increasing recurrence interval. This was especially the case in SDF basins 11 and 17, but the results are not presented here. 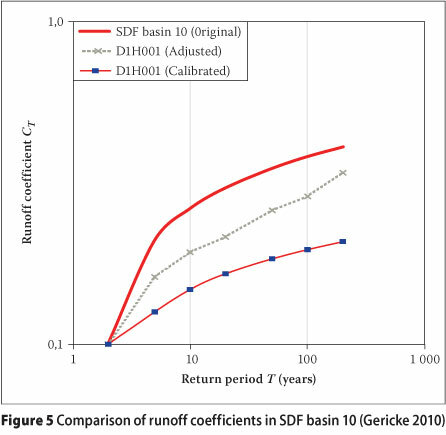 In SDF basin 9 the 20-year adjusted runoff coefficients exceeded the 50-year runoff coefficients. Similar results were also evident in SDF basin 18. The adjusted runoff coefficients, which exceeded unity and decreased in magnitude with increasing recurrence interval, deviated from the norm. Runoff coefficients exceeding unity indicate that more than a 100% runoff can occur, but this is physically impossible. An increase in the CT coefficients with return period is necessary to accommodate the known effects which also increase with return period, but the increase is not accounted for in Equation 4. The coaxially plotted values of CT (original, adjusted and calibrated) against the return period applicable to SDF basins 6, 7, 9, 10, 18 and 21 are shown in Figures 2 to 7. It is evident from Figure 2 that the calibrated CT coefficients in the quaternary catchments obtained from the primary study area are spread around those of Alexander (2003), but are generally lower in magnitude. Similar trends were also witnessed in the other SDF basins evaluated (Figures 4 to 6), except for SDF basins 6 and 21 (Figures 3 and 7). 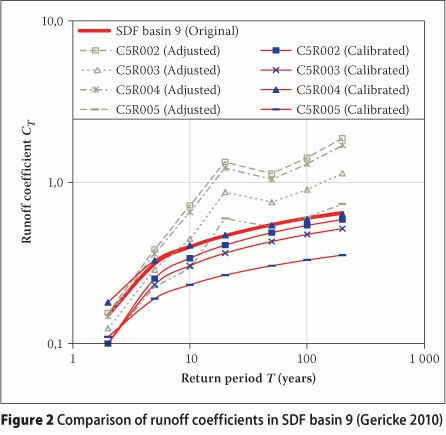 The curves representing the calibrated runoff coefficients had similar growth curves as a function of the recurrence interval in most of the basins under consideration. The decreasing trend in the adjusted runoff coefficients with an increase in recurrence interval is clearly evident from Figures 2 and 6, with the adjusted 20-year runoff coefficients highly questionable, since they are larger than the 50- and 100-year runoff coefficients. 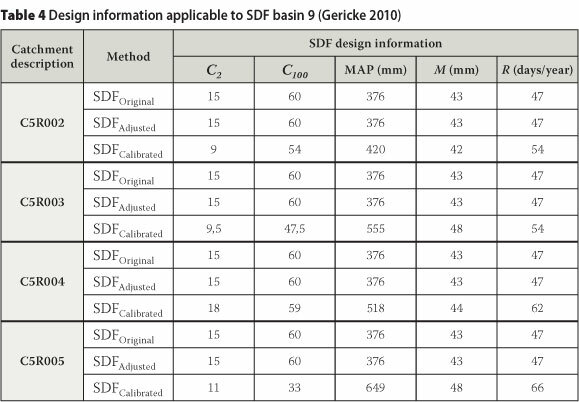 The comparison between the design flood peak values based on the probabilistic analyses and the original, adjusted and calibrated versions of the SDF method in SDF basin 9 (primary study area) is listed in Table 6. The average SDF/probability distribution ratios are also shown in the same table. 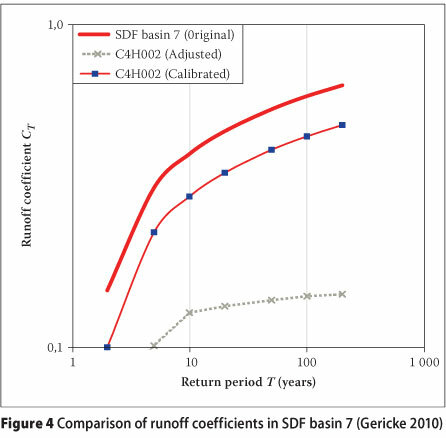 According to Van Bladeren (2005), the original SDF method tends to overestimate the more frequent design floods for return periods of up to 20 years in SDF basin 9, while the extreme events are underestimated. However, the results contained in Table 6 indicate that on average the original SDF method overestimated all the probabilistic flood peaks. The overestimation varied between 18% and 45%. Except for the 2-year return period, the adjusted SDF method overestimated all the flood peaks as well, with average overestimations of up to 204%. The calibrated version of the SDF method proved to be the most accurate, with the 2-year return period being underestimated on average by 7%, while the maximum overestimation was limited to 12%. 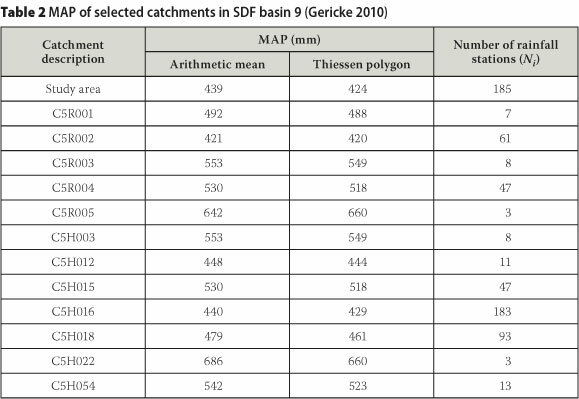 The primary study area (SDF basin 9) results as listed in Table 6, as well as the average SDF/probability distribution ratios obtained in SDF basins 6, 7, 10, 18 and 21 (used both for calibration and verification purposes) are illustrated in Figures 8 and 9 respectively. In addition, the average SDF/ probability distribution ratios obtained in the remaining 13 SDF basins (calibration only) are illustrated in Figures 10 and 11 respectively. 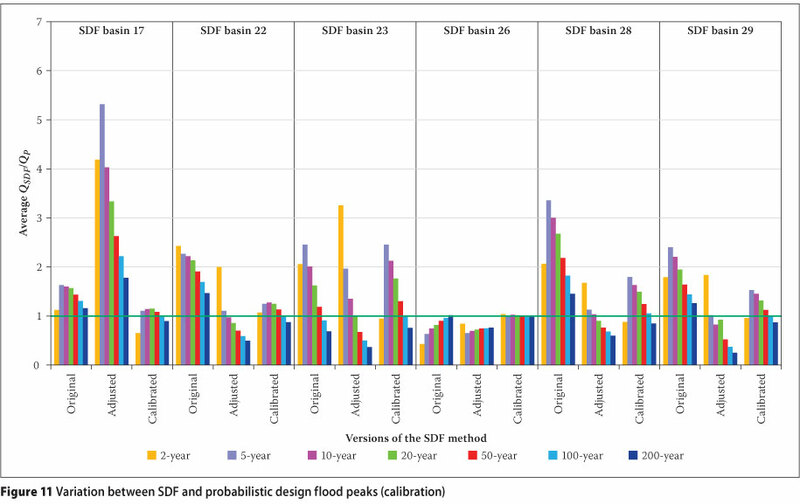 Apart from the above-mentioned results obtained in SDF basin 9, the original SDF method also overestimated the probabilistic flood peaks in all the other SDF basins under consideration, except in SDF basins 6 (200-year), 8 (2-year), 16 (2-year), 23 (100-and 200-year) and 26 (all return periods). On average, the ratio between the original SDF method and probability distributions varied between 0,43 and 5,77. The best results were evident in SDF basin 16 (Figure 10), with the overestimation limited to ± 12% for the return periods ranging from 10 to 200 years. The overall results (calibration and verification) of the adjusted SDF method were only better in 26% of all the basins under consideration when compared to those estimated by the original SDF method. 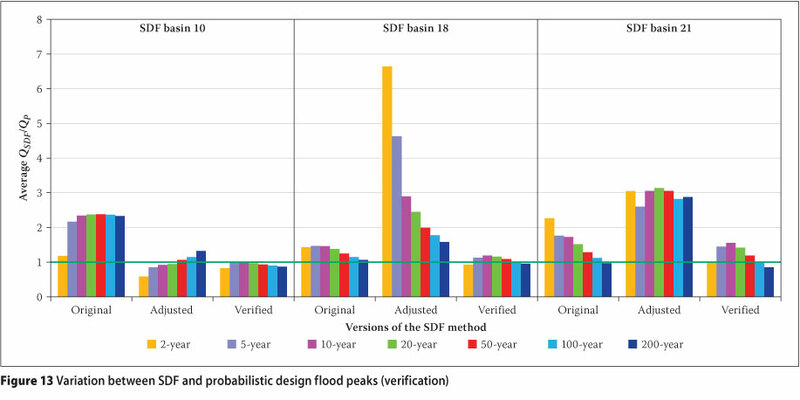 The adjusted SDF method demonstrated the most acceptable results in SDF basin 16 (Figure 10), and either significantly over- or underestimated the flood peak values in the remaining basins. On average, the adjusted SDF/ probability distribution ratios varied between 0,25 and 6,58, which seems improper. The calibrated version of the SDF method proved to be the most accurate in all the basins under consideration, except in SDF basin 6 (Figure 8), where it proved to be slightly less accurate than the adjusted SDF method. On average, the calibrated SDF/probability distribution ratios varied between 0,91 and 1,30, while at some basins and individual return periods, less accurate results were evident. In the methodology it was highlighted that the selection of verification catchments within the same basin was based on the fact that their physical and regional descriptors were similar. In other words, the catchments are situated within a smaller portion/number of quaternary catchments within the larger group of quaternary catchments used in the calibration exercise. The flood peaks estimated for verification purposes with calibrated runoff coefficients are referred to as SDFVerified (Q3). 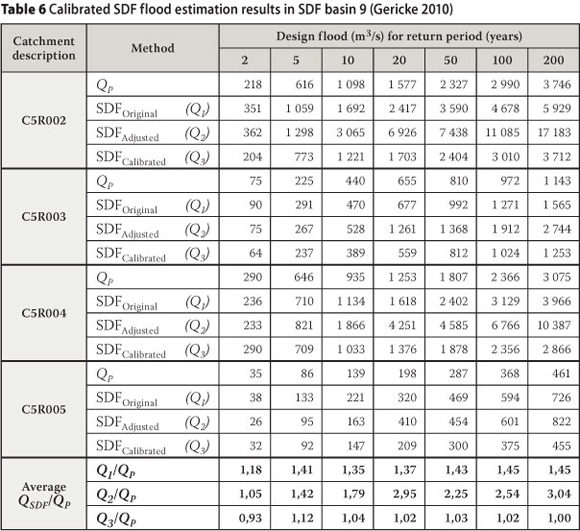 The comparison between the design flood peak values based on the probabilistic analyses and the original, adjusted and calibrated/verified versions of the SDF method in SDF basin 9 is listed in Table 7. The flow-gauging station numbers in brackets in column 1 are the stations used for the verification. 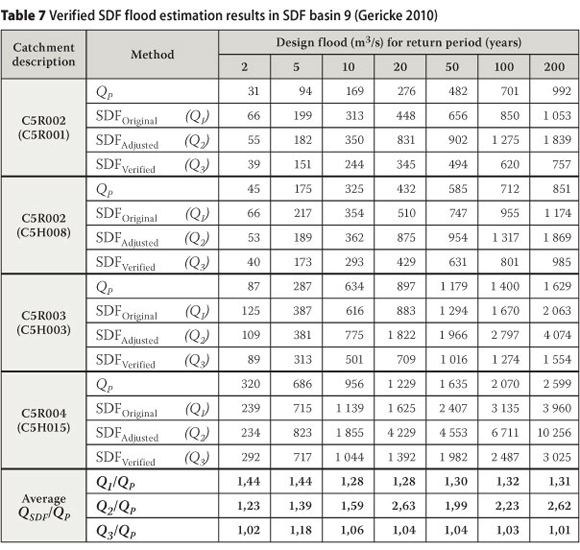 The verification results listed in Table 7 indicate that the original SDF method demonstrated the same trends of overestimating all the probabilistic flood peaks in SDF basin 9. However, the magnitude of overestimation of the 2- and 5-year return period floods were slightly larger, while the flood peaks for the remaining return periods showed some improvement with the overestimation being limited to ± 30%. The adjusted SDF method results also improved slightly and were characterised by overes-timations of up to 163%. The verification results confirmed that the calibrated SDF method was the most accurate, and similar trends were evident. On average, the verified SDF/probability distribution ratios varied between 1,01 and 1,18, which is considered to be acceptable. Figures 12 and 13 provide a visual measure of performance showing the average SDF/probability distribution ratios in the primary study area (SDF basin 9) and SDF basins 6, 7, 10, 18 and 21 obtained during the verification exercise. (Figure 13). The calibrated/verified SDF method remains the preferred method in the latter basins, based on the higher degree of association and accuracy obtained. The original and adjusted versions of the SDF method also demonstrated similar trends as established during the calibration exercise, although some individual return period flood peaks were characterised by either a slightly improved or worse estimation. All the verification tests also confirmed that the calibrated runoff coefficients behaved in a probabilistic manner as anticipated, since the verification results showed that the calibrated/verified SDF method is the most accurate, and similar trends were evident in all the basins under consideration. The coefficients of determination (r2) results were indicative of a high degree of association between the observed AMS data and the theoretical probability distributions, with 0,85 and 0,79 respectively as the poorest correlations in the primary (SDF basin 9) and secondary study areas. In all the primary study area catchments, except C5R003, C5H003 and C5H018, the Chi-square statistic was less than the limiting critical value and the confidence level larger than the significance level. In other words, the null hypothesis could be accepted. This was also the case in 60% of the secondary study area catchments used to verify the calibrated SDF method. However, acceptance of the null hypothesis at low confidence levels (< 50%), highlighted the likelihood of differences to be present, especially at C5R001, C5R002 and C5H015 in SDF basin 9. Similar detectable differences were present in 12% of the secondary study area catchments. The GOF statistic results of the original, adjusted, calibrated and verified versions of the SDF method were evaluated within the context of their SDF/probability distribution ratios. In other words, pair values of the coefficient of determination and these ratios were evaluated in combination to get a true reflection of the accuracy. Typically, the calibrated and verified versions of the SDF method proved to be the most accurate, i.e. SDF/probability distribution ratios between 0,80 and 1,30 along with a high degree of association (r2 values > 0,9). On the other hand, the original and adjusted SDF methods also demonstrated a high degree of association, but it must be evaluated within the context of their poor SDF/probability distribution ratios, which were occasionally different by up to a factor of 3 or more. The influence of different variables on the calibration and verification results, as discussed, demonstrates that the probabilistic-based approach of the SDF method in its current format requires further refinement at a quaternary catchment scale. The conclusions and recommendations in the following section will synthesise the results in order to address these requirements. 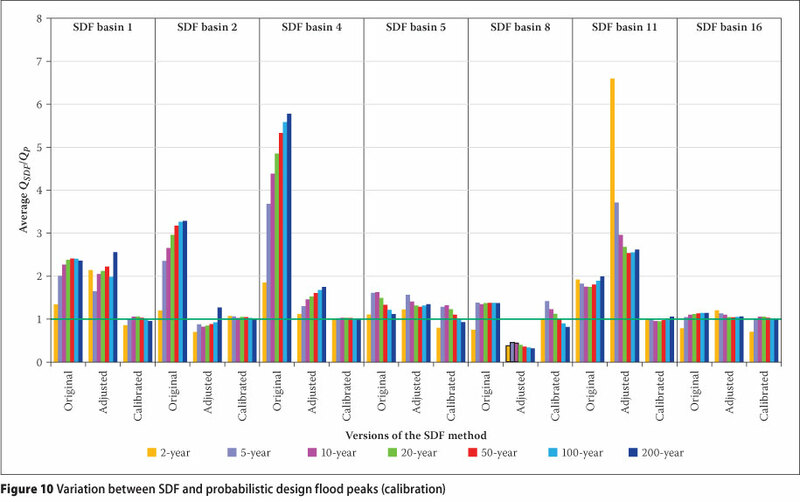 The main purpose of this study was to establish whether or not the probabilistic-based approach of the SDF method has the ability to overcome some of the deficiencies evident in the other design flood estimation methods used in South Africa. Although the study was limited to only 19 of the 29 SDF basins in South Africa, the overall results are considered to be representative in a South African context, while all the hypothesis statements were investigated and confirmed. ■ Probabilistic analyses: The results confirmed that the LN, LP3 and GEV distributions or a combination thereof using Equation 1, are the most suitable probability distributions for flood frequency analysis in South Africa at a single site (Hypothesis 4). The selection and use of probability distribution pair combinations for specific return periods can only be based on the statistical properties, visual inspection of the plotted values and GOF statistics. However, regional analyses of pooled-AMS could also be conducted to overcome the problem of short flow record lengths at single sites in addition to the MLVA. ■ Selection of representative rainfall stations: The use of average meteorological conditions and record length as criteria to select single representative rainfall stations in each catchment under consideration confirmed Hypothesis 2, which stated that the flood-producing characteristics within the current delineated SDF basins are non-homogeneous. The newly identified single rainfall stations proved to be a much better representation of the hydrological response at a smaller scale or catchment level. ■ Numerical calibration of runoff coefficients: It was evident from this study that the calibrated CT coefficients at a quaternary catchment level significantly improved the accuracy of the flood peak estimation using the SDF method (Hypothesis 1). The effort made by Van Bladeren (2005) to regionalise the runoff coefficients requires further improvement, since some of the adjusted runoff coefficients exceeded unity and other had a tendency to decrease in magnitude with increasing recurrence interval. The relationships established between the parameters (multiplier and exponent) of the power-law function (Equation 4) fitted to the CT coefficients as a function of return period and regional descriptors, are also questionable, because the likelihood that a catchment is to be more saturated at the start of a storm with a longer recurrence interval was ignored. These results are in agreement with similar studies conducted on the RM in South Africa (Parak & Pegram 2006) and Australia (Pilgrim & Cordery 1993), which confirmed that no relationship can be successfully established between the regional descriptors and the CT values in order to regress the runoff coefficients. It also confirms that the CT coefficients are essentially functions of the return period and time of concentration as conjectured (Hypothesis 3). ■ Calibrated and verified flood peaks: The calibrated/verified version of the SDF method proved to be the most accurate at a quaternary catchment level, thus enhancing the accuracy and practical use of the original SDF method (Hypothesis 1). The degree or extent to which the original SDF method overestimated the magnitude and frequency of flood peaks varied from basin to basin. Apart from the previously discussed factors, this is also due to the influence of different climatic regions, types of weather and rainfall occurrence frequencies on the depth, area, duration and movement of storm rainfall. The original SDF/probability distribution ratios were the highest in the northern inland regions (SDF basins 1, 2 and 4), the Highveld (SDF basins 6 and 7), Lesotho (SDF basins 10 and 11) and southern coastal regions (SDF basins 22 and 23) with summer convective rainfall. In these regions the flood-peak ratios were occasionally different by up to a factor of 3 or more. The southern coastal regions (SDF basins 16 to 18) with winter orographic/frontal rainfall demonstrated the best flood peak ratios with flatter growth curves as a function of the recurrence interval and varied between 0,8 and 1,6. ■ Statistical assessment of results: Both the coefficient of determination and Chi-square statistic can be satisfactorily used to evaluate the GOF of theoretical probability distributions and other design flood estimation methods. However, the Chi-square statistic proved to be more sensitive towards short record lengths, inconsistency, non-homogeneity and non-stationarity of data. ■ Review of the current regional boundaries of the SDF basins by increasing the number of SDF basins based on single or multiple quaternary catchment boundaries. The availability of hydrological (flow) and meteorological (rainfall) data, as well as the extent of the hydrological homogeneity within the identified catchments, will have an influence on the identification and delineation of the new basins. ■ Improvement and extension of the data pool of hydrological and meteorological gauging sites by updating the data sets to ensure that periods of observation are as long as possible. All available historical information of flood peaks should be included in and made available from a central database. ■ Utilisation of the Regional Linear Moment Algorithm and Scale Invariance (RLMA&SI) approach (Smithers & Schulze 2000a) to estimate design rainfall. ■ Establishment of physical or regional descriptors on which to regress the calibrated runoff coefficients to enable the extension thereof to ungauged catchments. All these results emphasised that there is no single design flood estimation method that is superior to all other methods used to address the wide variety of flood magnitude frequency problems that are encountered in practice. Design engineers still have to apply their own experience and knowledge to these particular problems until the search for a universally applicable design flood method in South Africa produces a method by which to overcome all the inherent uncertainties present in flood hydrology. JACO GERICKE has lectured in Hydrology, rrigation and Water Engineering at the Centra University of Technology, Free State (CUT FS) for the past seven years. He has a special interest in flood hydrology, water resources management and hydrological modelling. He received the BTech Eng (Civil) and MTech Eng (Water) degrees from the CUT FS, and the BSc (Hons) Applied Science: Water Resources Engineering degree from the University of Pretoria (UP). He worked for six years at the Department of Water Affairs before joining the CUT FS. The results presented in this paper form part of his research towards the MSc Eng degree from the Stellenbosch University (2010). DR KOBUS DU PLESSIS has lectured in Hydrology, Water Engineering and Environmental Engineering at the Stellenbosch University (SU) for the past eight years. He has a special interest in water demand management and the implementation process as applied by municipalities. He served as a director in a Tiunicipal water division for seven years before joining the SU. After obtaining the B Eng (Civil) and M Eng (Water Resources Management) deg rees from the SU, he worked for the Department of Water Affairs, the City of Cape Town and the West Coast District Municipality. In 2011 he was awarded a PhD degree from the SU for his work done on integrated water management for local governance in South Africa.